PLC School has fully licensed, official software and operating systems installed on computers in the classroom. The installed versions may not be the very latest, but the core functions and processes are still relevant to later versions to a large extent. This is ideal for beginners, those who wish to learn the basics further, and students who don't have official software, or access to their own PC or device. You may have the very latest software installed on your own laptop or company PCs and devices. In this case, the processes and use of more recent software can be taught using the latest references and tutorials. All software and operating systems installed at PLC School are official and fully licensed. All brands, trademarks, and logos are subject to the owner's copyright. PLC School is not associated with any commercial brand. This is a starter course for those who wish to learn from the beginning, or improve their overall computer skills. Learn how the operating system works, practise your typing skills and learn how to capture, store and transport new documents and pictures as digital files. This course is a guide to what's available online and how to create or add your own online accounts and materials. Online communications such as emails, video chat and voice calls are covered. You can also learn how to publish or edit your own media such as blogs, videos and music. An application refers to application software (apps) which are programs that run on your computer's system. Application software includes word processors, spreadsheets, graphic design programs, games, media players etc. 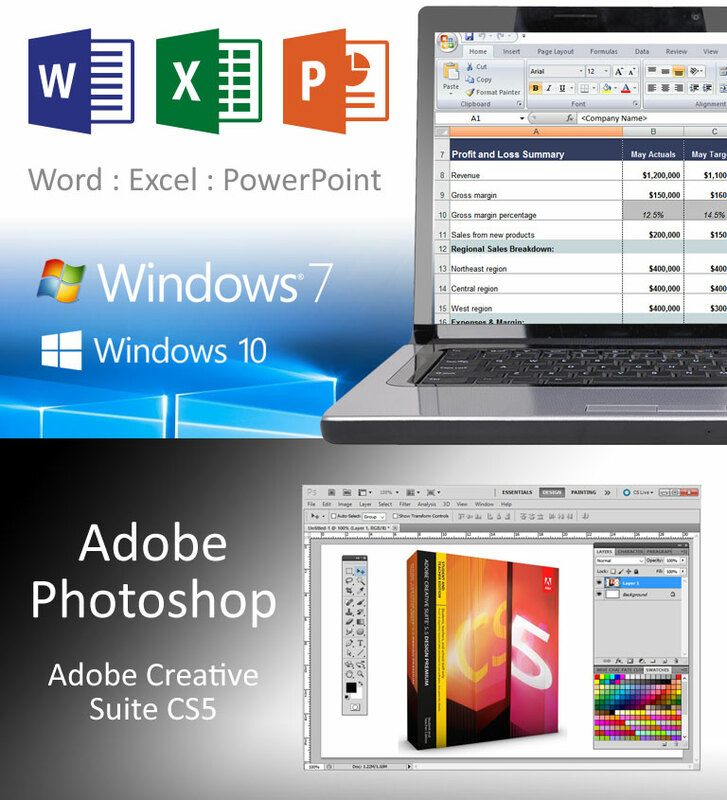 Microsoft Office Courses are available at PLC School for both corporate and private students. This suite of programs is commonly used in the workplace. There are several elements that all work together within the Windows (or Mac) operating systems. PLC School and Training Centre focus on the key elements and can teach from the very beginning, or help to advance your knowledge. Learning starts from the Microsoft Office 2007 application. This version includes the graphical user interface called the Fluent User Interface, known as the Ribbon. This replaced the menus and toolbars that were found on previous versions with a new tabbed toolbar. Versions prior to 2007 do not have the same navigation interface. The Microsoft Office 2007 course will enable you to learn from an important software update point, and put you in good standing to go on to the later versions. The later versions have the same elements and functions, but include more or different features, such as extended file format support, user interface updates, support for touch, sharing and cloud environments, or payment by subscription (Office 365). There are many elements to this software, some more advanced than others. You can focus on one aspect or you can work through each application to gain a good overview of the main components (Word, Excel, Powerpoint). This is a widely used word processing software from Microsoft™. It can be used to create all kinds of documents with custom layouts or templates. Many businesses use Microsoft Word to create and print in-house literature, or as the standard software for company files. You can learn about the menu items, managing and saving files, importing images, creating tables and layouts, and much more. Microsoft Excel is a commercial spreadsheet application featuring calculation, graphing tools, pivot tables, and a macro programming language for Applications. It is commonly used for data and data involving calculation. Sum formulas, charts, tables and control of layouts and output are all covered in the course. Powerpoint is presentation software and is commonly used for commercial presentations and slideshows. It is far easier to use than animation software and you can incorporate text and images along with special effects and animated elements. Part of this course involves working with clip-art and your own images along with many of the more advanced features. Discounts: Study time is available in 15, 20 and 60 hour blocks. Discounts apply and depend on the number of hours or the number of students per class. Foreign Students: Computer studies are open to foreign students and education visas are available in some cases. 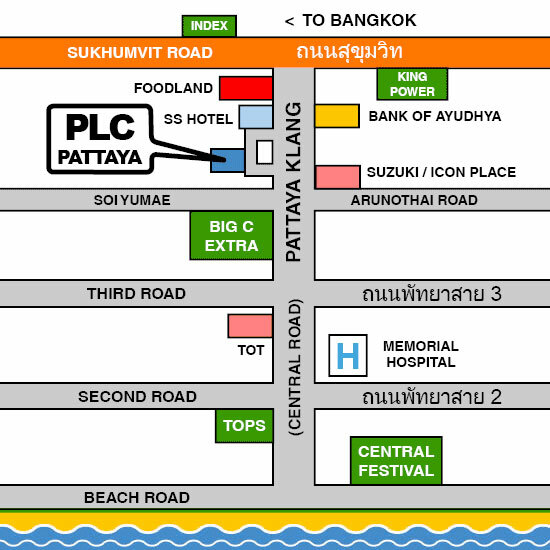 The department and courses are run by Thai teachers and staff. English speaking tutors are subject to availability. Please contact us if you would like to take a computer course as a foreign student. Education visa (6 months or 1 year) - A set number of study hours and weekly class attendance is a legal requirement. Some computer studies do not meet this requirement.